Distance 2.6 miles (4.2 km). Grid reference SX051890 to SX078907. 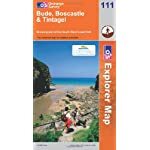 The section between Tintagel and Boscastle is relatively short but there are many features to interest all types of walkers. Leaving the car in the main car park at Fore Street, Tintagel, take time out to explore the village and browse through the leaflets and information booklets in the nearby Tourist Information Centre (Tel. 01840 779084) at Bossiney Road. An excellent guidebook is the South West Coast Path: National Trail Guide - Minehead to Padstow by Roland Tarr. Take the signed route 'To The Castle' following the wide road as it leads down towards the coast. If you wish you can make a detour at its end to visit Tintagel Haven beach or enter the English Heritage maintained Tintagel Castle if time and finances allow. Otherwise continue up a few steps on your right to the NT property of Barras Nose - grid reference SX053894. Look below to see the inlet and cave on the western side of Barras Nose. Continue eastwards over a boardwalk and then take the right hand fork at the path junction unless you wish to visit its tip - offering fine views northeasterly up the coast towards Willapark and the Cambeak. Climb steps looking ahead to the imposing headland of Willapark. Negotiate a wooden kissing gate and climb steadily up Smith's Cliff - heading for the large inlet at Gullastem, ignore the paths off to the right here as they lead to Tintagel and Bossiney respectively. Pass a marker post as you continue climbing passing the NT omega for Willapark. Now about 45 minutes into your walk, you enter the large grassy plateau atop Willapark - grid reference SX061898 and once again there is a path seaward for the adventurous. There are also the remains of an Iron Age Cliff Castle and an old limekiln here. The large rock just offshore is Lye Rock with its smaller neighbouring rocks known as The Sisters. Follow the lower path down from Willapark pausing above the curiously shaped Elephant Rock. Drop down steeply towards Bossiney Haven passing the NT exit marker as you descend. Climb once more then cross the footbridge as you also pass the NT exit omega for Willapark. Climb the 60-odd wooden fronted steps before crossing a stile as you enter the NT property of Bossiney Cliffs. At the 4-way meeting of paths you can bear left down the narrow rocky path to visit the tiny rock strewn cove of Bossiney Haven - Grid Ref. SX068895 - well worth a visit at low tide. We chose this option before returning to the path crossroads and continuing east towards Trevalga. Walk along the NT property of Bossiney Common and over Benoath Cove - grid reference SX069895, quite an expanse of golden sand is revealed at low tide. Look back over your left shoulder towards Willapark to see Lye Rock, a bird colony once housing the biggest Puffin colony in Cornwall. You may also be lucky to see a seal as they regularly explore the caves at the foot of the cliffs all around here. About 10 minutes steady walking east leads you to a seat above Rocky Valley, a good spot for a photo or a picnic. Pass the NT omega for Rocky Valley and waymark post as you descend steeply down the steps into the valley, pause awhile to look seaward at the steep sided inlet on your way down. Cross the footbridge over the gushing stream to zig zag your way up the eastern slopes of the valley. Take care on the slaty steps if it has been raining. At the top, pass the NT exit marker for Rocky Valley as the route levels out above the unstable inlet of Trewethet Gut. Take care to follow the correct path as the gully is a site of recent erosion and diversions may be in place. Look ahead to see the spectacular rocky pinnacles at Trevalga Cliff. The path swings north-westerly here as you take a path to seaward of the Trewethett Camping and Caravan Site on the clifftop. Climb steadily to a slate stile as you make your way up Firebeacon Hill - grid reference SX077907. Below lies Trambley Cove and the offshore Saddle Rocks. Pass above Darvis's Point looking seaward for some fine scenery. You should be able to make out Lye Rock and western Willapark to the west and the fractured 200ft high hulk of Long Island directly below you. At the crest near a bench seat, walk seaward a few steps to see Ladies Window Rock Arch and Short Island. Take care if you wish to visit this feature as the slate can be very slippery if it has been raining. This is the end of this section. To make an inland return via the hamlet of Trevalga, follow the path down from the hill crossing a small stream via a boardwalk. At a waymark post for Trevalga, head right through a wooden kissing gate beside a farm gate and into Trevalga. A mix of footpaths and roads lead back to Tintagel.